Billu, Oh what do I say about this gem of a movie? This is a movie which is among my top SRK flicks. People may be surprised for this choice. But this is the movie which I can absolutely watch any number of times. This movie brings out the innocence of regular people. It catches the human behavior at its very basic elements. While showcasing the stark difference between the lives of 2 people at opposite ends of a spectrum, and yet binding them together with one common thread. It talks about dreams and belief. It is a story of Billu who is a barber by profession. Not being able to keep up with the modernization and “show shining” of the world, he is striving really hard to make ends meet. His family, Bindiya, Ronak and Gunja, though love him, still they are not overwhelmed by his hard work. He loves them in spite of his children’s taunts and wistfulness about their conditions. Bindiya is one of the sweetest and most real character written in Hindi cinema. She is strong, loyal and stands by Billu against the world through thick and thin. And yet her humanness comes to front when faced with the stark harshness of everyday life. On the other hand there is the superstar Sahir Khan. He has been portrayed larger than life and much more flamboyant. He drives huge cars, wears shiny clothes and is always surrounded by his huge entourage. His world is shiny, glamorous and over the top. He is actually a simple guy who has worked hard on his way up the success ladder. He is a stable headed star who knows the shenanigans that he is forced to be a part of may not appeal to him directly, but work in the bigger picture. The story begins when Sahir Khan and his team arrive in Billu’s village Budbuda, for shooting a portion of their film. Billu’s kids have been brought up with this tale of Billu being friends with the superstar Sahir Khan. This news spreads across the village and suddenly the entire village comes forward with gifts and favors for Billu, with the hope of meeting Sahir Khan. The entire movie goes about Billu trying his hardest to get an audience with Sahir Khan. Do Billu and Sahir Khan really have any connection? Will Sahir Khan recognize Billu when he comes in front of him? Or is this all just a fancy fairy tale woven by Billu in an attempt to have some sort of connection to the starry world outside his dreary life? 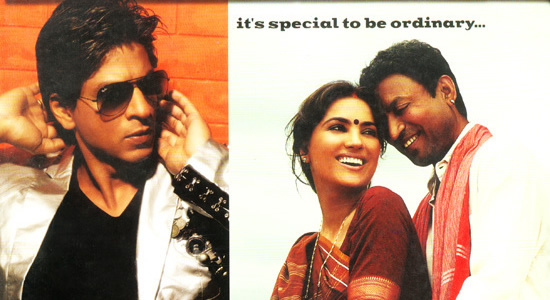 The performances by Irrfan Khan and Lara Dutta as Billu and Bindiya are superb. They both have gently entered into the characters and have made them so lovable and real. Irrfan Khan is beyond amazing with his portrayal of a man who has not succeeded in his life, but who is still trying to find little pockets of happiness. His pain, pride, embarrassment and love, which pours from his eyes in the scene at the end, when Sahir Khan hugs him, tells a million stories. Shah Rukh Khan is mind blowing in this story as the superstar Sahir Khan. 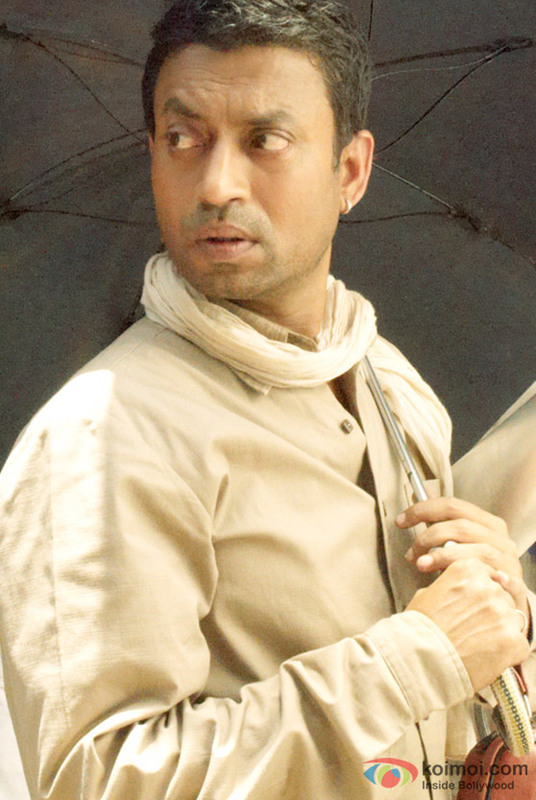 Though he does not have as much screen time as Billu, the couple of scenes, especially the one with Manoj Joshi, the one with Atul Parchure, his speech at the school function, and the finale scene with Irrfan Khan, steal the show. It is for these scenes that I can watch the entire movie again and agian. The supporting cast Of Om Puri, Rajpal Yadav, Asrani and Rasika Joshi add on to the beauty of this simple yet endearing story. This simple story talks about dreams, simplicity, innocence, wistfulness, hope and friendship. It looks at human relations in the best and worst of situations. Though the movie did not do as well as expected when it released. Just like many SRK flicks, this one too was ahead of its times. I wish the movie could have released today. Thank you SRK for producing this beautiful story and for giving us the gorgeous characters of Billu, Sahir and Bindiya in our lives.